We take a lot of pride in our oysters. Once you taste one, you'll understand why. Our oysters wow diners around the country because of their sweet-buttery flavor and plump meats. We put a lot of care and effort in to raising them from the first day the seed arrives until they are ready for market. We cull our oysters for quality and shape by hand, and only the finest oysters make it into our bags. You can learn all about our growing process here. 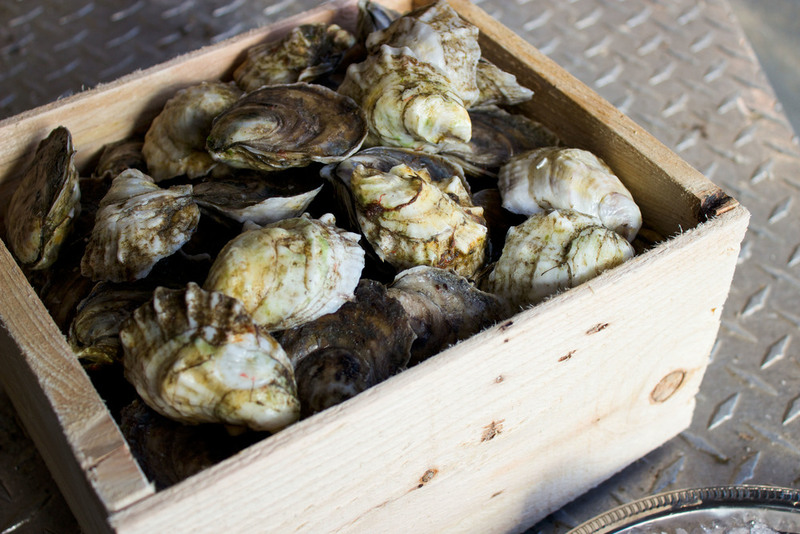 Our oysters are available for wholesale purchases for distributors, restaurants, and markets throughout the US and Canada. Product can be shipped, delivered, or picked up through Pangea Shellfish Company using the details via our Contact page. Standish Shore Selects are our signature Duxbury Bay oyster. These are the beauties we wish all our oysters would look like, but they all cannot make this grade. Sweet and buttery with nice deep cups. The Petites are a slightly smaller version of our Standish Shore Selects. These are gorgeous oysters that must have a good cup to make the grade. Pangea Pearls are a very special oyster on the farm - less than 2% of our oysters make this grade! Smaller than the Standish Shore Petites, the Pearls have extremely deep cups and are tumbled often to mimic the shape of the Kumamoto Oyster. These are the misshapen oysters that do no make the Select grade. The meats are great, but shells may be irregularly shaped. These are great for shucking and serving out of the shell, but many customers also serve them in the shell. Standards are a less expensive option but you still get a great quality oyster. These oysters are just too large to sell as selects. These are the oysters that were missed when harvesting, and allowed to grow another season. These are excellent for baking or for the brave to eat raw! These are the oysters that were missed when harvesting for a couple of years. They are true jumbos and are a knife and fork deal! A bag of 50ct could weigh from 25 to 35 pounds. ©2014 Pangea Shellfish & Seafood Company, Inc., All Rights Reserved. Standish Shore Oysters® is a registered trademark of Pangea Shellfish Company.